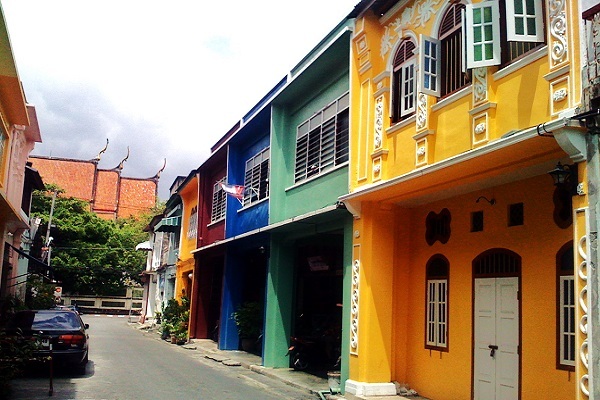 The Old Town is really worth a day trip with its beautifully ornate old shophouses, Buddhist and Chinese temples, some lovely museums and magnificent Sino-Colonial mansions, once erected by Phuket’s tin barons. You could start your tour at Promthep Clock Tower at the intersection of Phang Nga Road and Thepkasatri Road. At the next intersection you already reach Thalang Road, the core of Phuket’s Old Town and the commercial centre of the past. A lot of renovation has been done in recent years and the ugly electric and telephone cables have disappeared, so the beautiful Sino-Portuguese or Sino-Colonial shop houses in Thalang Road are great photo motifs now. Here you also find a small, but good tourist information center and our favourite place for a coffee or snack, the beautiful garden terrace of the China Inn. Many of these shop houses have covered arcades that join shops together and provide shelter from sun and rain for pedestrians. The architecture reflects both European (including Portuguese and British) and Chinese influence. The latter being the most important players in Phuket’s tin mining industry in the 18th century and also in building Old Phuket Town. Another architectural highlight of Old Phuket Town are stately Sino-colonial mansions, being the former homes of rich Chinese tin barons or merchants. The greatest example is maybe the Blue Elephant Governor Mansion in 96 Krabi Road. If you still have time left, you can also visit the Phuket Thai Hua Museum in Thalang Road. Built in 1911, this building was a Chinese school originally and now features a nice museum about Phuket’s history. In the eastern part of Thalang Road is Queen Sirikit Garden, a small park built in 2004 to commemorate her 72th birthday. We like the place because the big Golden Dragon sculpture at its entrance is a great photo motif. Directly next to it you can find the building of Tourism Authority of Thailand. Wat Putta Mongkon Nimit in Dibuk Road, just opposite of Soi Romanee, is one of the most beautiful Buddhist temples in Phuket Town. It features all famous elements of Thai temple architecture like the steep multi-tiered gable roof with stylised finials at the ridge and eaves, called cho fa, which resemble the beak of a bird. The Old Phuket Post Office, built in 1932, at the intersection of Thalang and Montri Road is now the home of Phuket’s Philatelic Museum. Opening hours are Mo-Fr 8:30-16:30 and Sa 9:00-12:00. On Hotel in Phang Nga Road has become famous since Leonardo DiCaprio’s movie “The Beach”. According to the movie the scene showed a hotel in Bangkok’s Khaosan Road, but the movie shooting was actually done in On On Hotel here in Phuket Town. Thavorn Hotel in Rasada Road is Phuket’s oldest hotel. It hosts a nice collection of photos and antiques. Have a look in the lobby and you can feel the time wrap atmosphere.